There are many things that make iOS great, but the Lock Screen is not one of them. It is currently not possible to view more information in the iOS Lock Screen except for the date, time, and notifications. Still, there is a way to display weather information on the Lock Screen. iOS 12 has a feature that opens the way for weather information to appear in the Lock Screen. This confidential feature of iOS 12 appears in the Lock Screen of iPhone X when WWDC 2018 talked about enhancements to the Do Not Disturb feature of Craig Federighi, Apple's Vice President of Software Engineering, during the opening talk. As you can imagine, Sleeping Time Mode is part of the Distraction feature. With the Sleep Mode enabled on an iPhone, where the Disturb feature is enabled, the weather can be added to the Lock Screen. But how? In this post we will try to give you the answer. The Weather application needs to always access your location so that the weather information appears on the Lock Screen. If you set the location access for Weather app to "Using App" or "Never", the weather information will not appear on the Lock Screen. From the Settings> Privacy> Location Services menu, click Weather and make sure "Always" is selected. Sleep Time Mode needs to be enabled in the options of the Do Not Disturb feature for the weather information to appear in the Lock Screen. The end result of using the Do not Disturb feature on time, when the time comes, will automatically turn off the feature and you will see a weather message on the Lock Screen and a greeting message like "Good Morning", "Good Morning". You can follow the steps below to show weather information on the Lock Screen. Step 2: Touch the Do Not Disturb menu. Move the key next to the scheduled option to green. Select Start time and End time and set the switch next to Sleep Time Mode to green. Sleep Timing Mode will be triggered with the disconnection of the Do Not Disturb feature, which will be activated at the automatically determined time, with the weather information and the welcome message will be displayed. 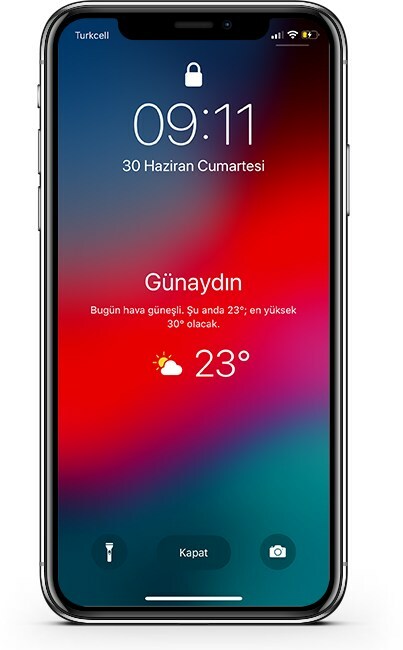 When you unlock your iPhone, anda weather information will automatically disappear.